Here’s the very first Forward The Hamlet blog post. Why is this happening? Why not? You can’t stop us, you’re not our Dad. We’ll have a little bit on who we are, what we do and why we do it. Then there will be a brief look back over the past couple of weeks at the club. To finish, we’ll give you a little insight into what’s coming next for both the club and the podcast. Hugo Greenhalgh – a fresh-faced, presentable young man who spends most of his time writing for various online football outlets. Has been involved with Dulwich Hamlet for the past two years. Find him on the terraces spouting David Brentisms and accidentally Partridging at every given opportunity. Ben Sibley – a tired-looking, weathered slightly less-young man who spends most of his time managing a website. Has been involved with Dulwich Hamlet for approximately 180 days less than Hugo. Find him on the terraces being wound up by a man in a striped orange bobble-hat. 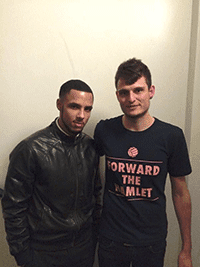 We produce Forward The Hamlet, the premier Dulwich Hamlet podcast. Due to the lack of other DHFC podcasts, this title goes relatively unchallenged. We interview current players and the management team, DHFC fans, ex-players, and club staff. Basically, anyone connected in some way with the club. 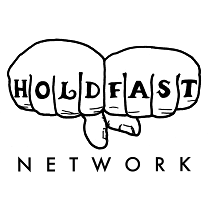 Then we add in some hilarious (terrible) quips, a quick roundup of club news, and some brilliant intro music (courtesy of Robert Molloy-Vaughan – who founded the club in 2011*). Tis fortnightly, as we’re lazy. Podcasts are the new…minidiscs. And because since becoming involved with the club, it has genuinely had a huge effect on both of our lives. We wanted to give something very small back to the club, and to the fans – many of which will be friends for years to come. So much that it would be foolish of us to begin any further back than the Wednesday just gone. Plus it makes a good starting point. Dulwich Hamlet is 125 in 2018. 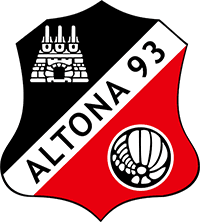 So is the Hamburg-based non-league club Altona 93. The two clubs have a close relationship due to a DHFC fan and his chance meeting with the editor of the Altona 93 fanzine during a ground-hop in 2010. To mark the joint birthday, DHFC fans are attempting to raise enough money to fund a first-team pre-season trip to Hamburg in three years’ time. Wednesday 04 March 2015 saw the very first fundraising event of the ‘Intercity 125 appeal’ – a quiz held in the DHFC clubhouse. £282.50 was raised – a fine start. We’ll have more news on the appeal in the coming months. Tomorrow (Saturday 07 March), Dulwich welcome newly-promoted VCD Athletic to Champion Hill for the very first time. Dulwich grabbed three points from the reverse fixture on matchday 11 with a 3-0 win and we’ll be hoping for an upturn in form after three defeats in our last five games. It’s looking like a very busy day, both for us and the club. To mark International Women’s Day (the day after the game), the club has offered free admission to women’s football teams based in South London. It’s the very first time this has been done, and follows on from a number of initiatives this season that have garnered much coverage in the press. We’re delighted that football writer Laura Jones will be making her first trip to Dulwich for the game – she has kindly agreed to spare 5/10 minutes for us during the day and we’re very much looking forward to meet her. 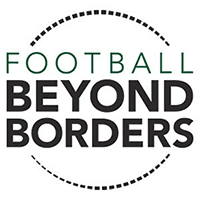 Football Beyond Borders (FBB) return to Champion Hill, two weeks after their first visit. They made a huge impression and we are lucky to have the chance to speak with Tom Perez – FBB Head of Campaigns & Communications. You’ll hear our chat with Tom in the next episode, due out Tuesday 17 March. If you’ve made it this far, you should probably re-evaluate your priorities. Apologies for the length of this piece, we promise forthcoming posts will be much shorter. We’ll try and do this once a week, maybe more, maybe less depending on what’s going on.